When you're learning to play a musical instrument, unless you're a prodigy, you spend the first few years focused mainly on physically grappling with the instrument. You don't really worry much about how musical the result is because it's all you can do to just get the notes out. You're busy "wrestling with your own incompetence" as I recently heard somebody describe it. Eventually (read: hopefully) you get to the point where you achieve some level of competence and you realize that dazzling instrumental technique alone is the equivalent of being highly skilled at calisthenics – impressive maybe, but pointless. And then you get to the real study of being a musician. 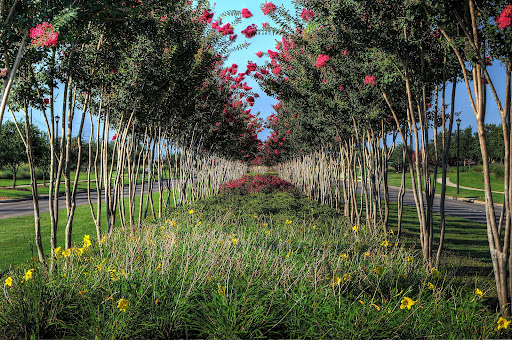 So that's a long-winded introduction to this photo of a grove of crepe myrtles in my neighborhood. When I took this shot, I was at a point where I was focused myopically on learning how to operate my camera. I took this and a number of other photos hoping for a great shot because the crepe myrtles were nicely blooming and the colors were nice. But I was disappointed with the result because none of the pictures had the sharpness I wanted. I judged this photo solely on how well I had bent the camera to my will, which given my focus at the time was quite reasonable. So this photo and its siblings were thrown into the fail pile. Now for the record, I don't feel like I've come close to "mastering" my camera yet. I'm very familiar with how everything works, but I don't have that effortless facility with it that a true master has. But music has taught me the hard way not to get overly distracted in pursuit of that and to devote a good portion of my time to how to make something artful with the technique that I have. So, I started seriously looking into photographic composition and graphic design. I'd been learning about Gestalt psychology as applied to design and I stumbled on this photo again. It's still a pretty meh photo and I still wish it were sharper, but one thing this photo does have going for it compositionally is that its a pretty good example of the "Law of Closure" from Gestalt theory. In a nutshell, the Law of Closure proposes that the mind will "fill in the blanks" when presented with an incomplete idea. For instance, in the photo below the three Pacman shapes can be arranged so that they form a triangle in the mind even though there is no triangle actually in the image. In my photo, the overhanging crepe myrtle branches, the vertical limbs, and the tops of the flower bed form a general circular structure and the mind does the rest. I didn't notice this when I took the photo so I can't say I exploited it deliberately. On the other hand, a lot of good things happen intuitively but you don't know why they're good until you examine them later. Composition is all about understanding the why, so you can actively identify opportunities and not have to rely on intuition to get a good photo. As a side note, one interesting facet of composition is, despite highfalutin names like "The Law of Closure," the principles don't pretend to be mandates on what constitutes compelling art. Rather, composition gives study to why some photos work and others don't, and all these "laws" and "rules" just characterize the findings. Unlike scientific and legal laws and rules, these are made to be broken whenever the spirit moves you. So, they're more like really good advice. Coming from a math/science background, it took me awhile to really feel comfortable with that. My brain embraces determinism. very interesting post. Unlike you, I was immediately drawn to the photo as being pretty dang cool for the 'closure' bit. I can see it is not overly crisp, and I can see why you - as composer - would be disappointed, since you are looking at it with an eye towards sharpness. Gestlat is a great word. Makes me want to grow a beard, smoke a pipe and time travel to a 60s party. When you talk about composing an image, I am reminded of when people talk about how much they hate Picasso, because it doesn't look like the real world. If they have art training, tho, they can see how he places his subjects in a certain place on the canvas. It doesn't matter that they have both eyes on the same side of the face, but if they had both eyes AND the subject was pressed off center against the side of the painting, then it would grate. Plus, as you say, he broke the rules, heh heh.